Much ink has been spilt these past couple weeks concerning the first sub $100 Android tablet with an Intel CPU, with many a tech blogger and their cousin writing about the great value. 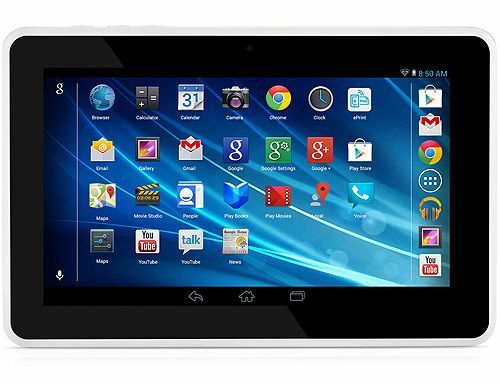 While many bloggers talked about the wonders of this tablet, few were willing to put there money where their mouth was and find out first hand whether HP could roll a tablet which broke the $100 barrier while still having good enough performance to be worth buying. I am one of those few, and now that I have had this tablet for a week I can see that HP has managed to release a serious competitor for the bottom of the market. B&N Starts Windows-only Promotion for International Nook Store – Does It Belong to MS Now? Thanks for the review, Nate. I’ve been curious about this tablet because it had a lot of pre-release press and no real reviews. In particular, I liked that you tested the battery life by playing a video. That gives me a more real-world benchmark than usual. I’m unlikely to buy this one myself. I don’t use a tablet for anything but reading and playing the occasional video, so my old Polaroid 701i still suits me. I will pass your info along to friends who are interested, though. I agree that it is a little frustrating that so many blogs covered the BF deal but so few reviewed the tablet. Great review – I’ve had one for a few days now and I’d say your review is very fair and balanced. I had a Hisense Sero LT but gave it away – the screen seemed much fuzzier than the HP 7 (despite the two have the same official resolution). Also I am pleased by the colors, but like you disappointed by the backlight intensity. I tried it out in Walmart while waiting for a prescription, and the strong fluorescent ceiling lights washed the screen out into mediocrity. On the drive home, I was sure I had made a purchasing error, but at home, under typical window lighting / minimal room lighting, the screen had good brightness and great colors. 1024*600 doesn’t sound very sharp these days, not when 1280*800 is “middle of the road” (original Nexus, current Asus Memo Pad HD 7, EVGA Tegra Note 7), but it was only a few years back when that resolution on a 10.1″ netbook was plenty to keep budget road warriors going strong. I wouldn’t want to read an e-book on the HP7, but catching up on FaceBook and other social media and reading USA Today are not painful chores. I used Dice Player to play some home-ripped h.264 videos and they played in synch, stutter free, smoothly. So Intel’s support of Power VR graphics has come a long way from their old netbook days (Atom 2600 etc.). I also found everyday chores to be zippy, comparable subjectively to the Asus Memo Pad HD 7 I have. Unlike the HD 7, this very inexpensive HP7 Mesquite didn’t have a problem spontaneously un-mounting my uSD card, and unlike my Nexus 7 2013, it hasn’t random re-booted so far. Of course this is a sample of one, and my HD 7 and Nexus 7 2013 problems are apparently rare – my bad luck (I never had problems with my very first Android tablet, the original Nexus). The HP7 is devoid of a lot of bells and whistles that we take for granted – GPS, compass, sophisticated motion detector (it seemingly only detects tablet orientation). But what it DOES have is well-done. I am surprised the third generation (already! Medfield > Clover Trail > Bay Trail) mobile-splace SOC (system on a chip) is so darn good from Intel. They certainly hosed the budget computer market with their dismal limitations on Netbooks, it is good to see them NOT making the same mistake in the tablet field. There is a lot of value in this tablet for grandma and grandpa’s emails and social networking and even online banking, ditto for budget travelers wanting to stay connected with something bigger than a smartphone. Oddly enough, I suspect the main purchases this holiday will be for kids, and since kids are all about games, that might be the one area in which the tablet falls short. But I’m not a gamer and can’t comment. Thanks! I think I’m getting the hang of these reviews. And I read ebooks on all of the tablets I test. I’ve never had a problem. You are right about reading books. I just had to choose the right type size for a good reading experience on the HP. So now reading and video watching are fine. Viewing wider web pages is problematic – the same problem as with the old 10.1″ netbooks with the same 1024*600 resolution – web pages are designed to be wider (minimum 1280 or 1368) or you have to sideways scroll. Also monster web pages like the NY Times put so many articles on the screen, that the smaller type fuzzes out with the 600p resolution on the HP – I find a 1280*800 is much better for me with the NY Times. There are easy work arounds with a tablet of course, like double tapping to fill the column. And of course unlike with a netbook of old, there are apps (NY Times mobile) that solve the text size problem. How do you screenshot on it?